Mobile devices have been lighting up the tech industry over the last few years. Industry report after report highlights increasing demand for mobile at the direct expense of the desktop. Mobile devices, by their very nature, are powered by batteries that have a finite runtime. Ever tried using your smartphone for a couple of days without charge? 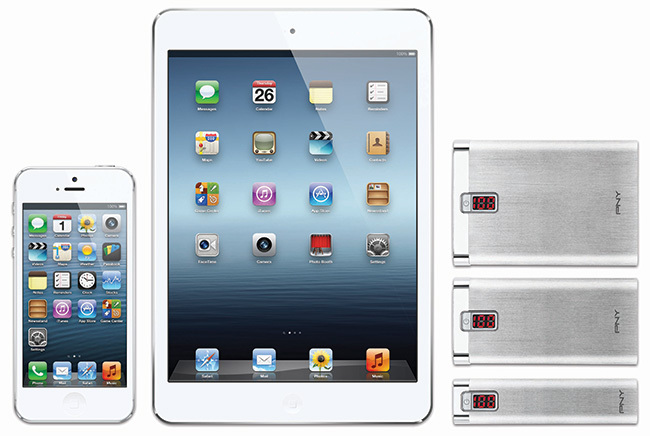 Travelled without keeping an iPad adapter handy? The need to keep devices' batteries charged, especially when on the road, has led to an explosion in growth for a nascent technology: mobile rechargeable batteries (MRBs). Often smaller than a pack of cards and able to carry enough juice to charge mobile phones, music players and tablets, via USB, these oh-so-handy peripherals are considered must-haves for anyone with multiple mobile devices, especially for people who don't want to carry multiple chargers around. MRBs can be defined by the battery type, capacity, and output. Most commonly, they are either based on lithium-ion (Li-ion) or lithium polymer (LiPo) technology - the latter tends to be lighter and more flexible in construction. In their most basic form, MRBs use a plastic or metal housing to conceal the battery inside, which is internally connected to USB header(s) that you plug devices into. A separate USB power inlet charges the battery from either the mains supply or via a computer. As the majority of the cost of an MRB lies with the battery, it makes implicit sense to consider brands that you trust. The cheapest MRBs, usually produced by no-name manufacturers, tend to use batteries of unknown origin, while well-known companies are likely to use branded Samsung cells that have a longer cycle life, faster charging capability, and better safety characteristics. Capacities are quoted in milliamp-hours (mAh), with higher being better, and one can calculate a constant measure of energy known as watt-hours (WHr) by multiplying the mAh figure by the battery's voltage. For example, a laptop battery running at 11.1V and having a 4,300mAh capacity will produce a steady 47.7WHr. Do be aware that MRBs tend to define capacity solely by the mAh rating, though it's fairly straightforward to determine the WHr figure as most have a native voltage of either 3.6V or 3.7V. Physical battery and MRB size is inextricably linked to capacity. The smallest tend to have a capacity of below 2,000mAh and are barely larger than a pack of chewing gum while the largest can offer as much as 10,000mAh and are the size of a small digital camera. Putting the size into context, here are three PNY Power Pack MRBs - 2,600mAh, 5,200mAh, and 7,800mAh - next to an iPad and iPhone. 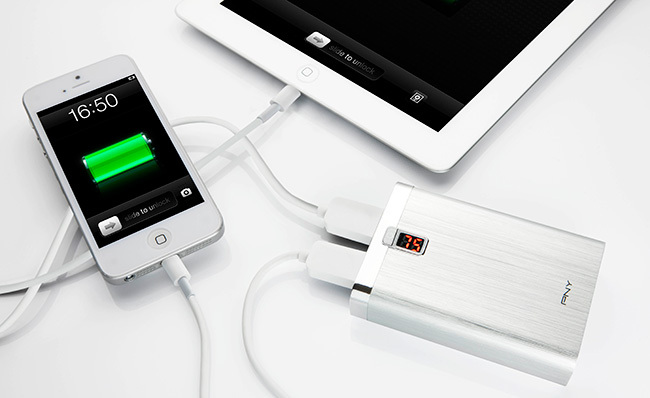 The largest PNY PowerPack, rated at 7,800mAh, top-right, weighs just 123g and can easily be stowed away in a small bag. So just how much power can it provide? Well, even the smaller MRBs are able to charge most smartphones' batteries from empty, while the larger-capacity models can easily charge a Google Nexus 7 tablet or provide enough power to keep an iPad going for another nine hours or so. Better MRBs, such as the two larger-capacity ones from PNY, have multiple outputs - usually 1A and 2A+ - to enable concurrent, faster charging for multiple devices. This is important if you need to charge both a smartphone and tablet at the same time. PNY, for example, has a digital readout on each Power Pack, letting the user know just how much charge is left in the battery - a handy feature that is not available on some of the competition. Which MRB is right for you? Capacity and budget dictates the choice of MRB. For the basic user, who finds that their smartphone is constantly running out of battery after a long day's texting or web-surfing, a 2,000mAh MRB is more than sufficient. Usually costing less than £20 and eminently pocketable, it's a must-have product for anyone with a mobile phone. Stepping it up a notch, people who use their mobile phones all day, usually for work purposes, would be best-served by a mid-capacity MRB - something in the region of 4,000mAh, costing between £20-£30. And for folk who need to charge tablets as well as smartphones on a regular basis opting for a 5,000mAh MRB makes a lot of sense. Mobile rechargeable batteries are the must-have accessory to anyone who carries a smartphone or tablet on a regular basis. Ensuring that you don't run out of power at a critical moment, more so when not close to a mains power supply, these handy devices make for the perfect Christmas gift. For full disclosure, this editorial was sponsored by PNY. The PNY Power Pack 2600 is available at Scan Computers and Currys. The PNY Power Pack 5200 is available at Scan Computers and Currys. The PNY Power Pack 7800 is available at Scan Computers and Currys. These gadgets are must have these days. My wife is always on the go and on her phone because of job; I got her a powerbank a couple months ago and she still can't stop thanking me for it.